My husband and I share a studio/office/craft room...whatever you want to call it. It's not a large room-about 9' x 11'-but we make it work. I'll only share about my side of the room. :) My desk was custom built by my husband two houses ago. Every time we move, we talk about scraping it, but we end up moving it every time. It measures 6' on each side. I love it...it gives me plenty of work space with plenty of storage beneath. He built it around some baskets that I already had from IKEA and roller carts that we had from Target. It's made from MDF (medium density fiber board). I painted it white. Most of my stash is in two places. The smaller pieces reside in a three drawer roller cart. 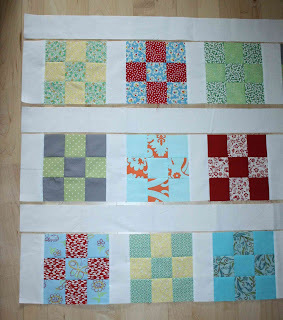 (right) I use the happy zombie's folding method for pieces 1 yard or less. I'd highly recommend it. The larger chunks of fabric are stored on the top right section of this shelf. I fold them around my 6" cutting ruler. They fit in the space so well. These are 2 yard pieces or larger. 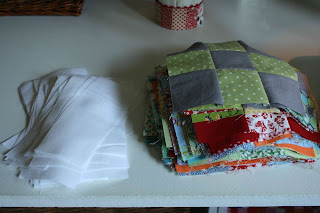 In the baskets are more scraps, completed blocks and binding strips. This is my view several hours a week. So there it is, my studio space. I'm so thankful to have a dedicated space in my home for my hobby. And I'm so very thankful for an understanding and handy husband. Do you care to share your workspace? If you do, blog about it and leave me a link to your post in the comments. I'd love to see your setup. it's done and i love it!!! 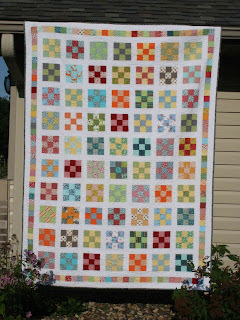 this is the best shot i could get of the quilt outside today. either it was too bright and all you could see is the texture, or it was not bright enough to get the full effect of the quilt. 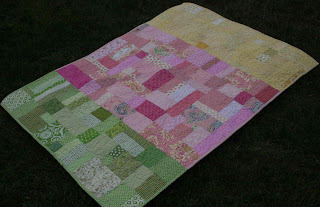 (photographing this quilt was quite frustrating!) 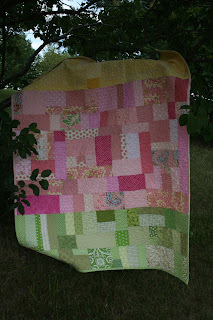 but really, is there anything prettier than a quilt billowing in the breeze? what i need is a clothesline! 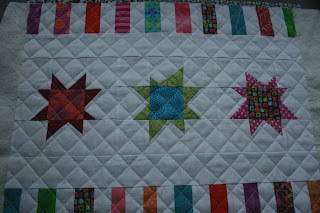 here's a close up of the quilting. 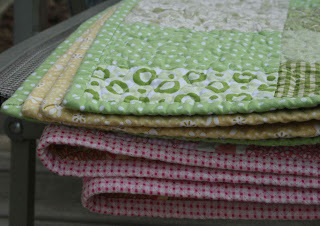 i really like quilting in circles. it's fun! 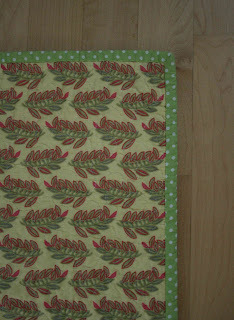 i used a katie jump rope fabric for the backing and a bright green flea market fancy print for the binding. I LOVE this print on the binding. it measures 64" x 83". The winner of the strings is Mandy! I received an email from Sarah in Canada who also has a bunch of strings that she is offering up, so I picked a second winner. How sweet is that? Thank you so much, Sarah! The winner of Sarah's scraps is Karen. 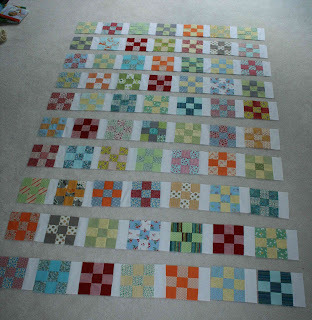 I'm done piecing the strips for my spiderweb blocks. I have a *few* strips leftover. (Actually, a basket full.) They would work in any string quilt. If you want a chance to win them, leave me a comment on this post. I'll pick a name on Tuesday. One comment per person please. ...to make a twin size spiderweb quilt. i cannot wait to see this one come together. you'd think my scrap basket would be empty by now, but somehow that's not the case. 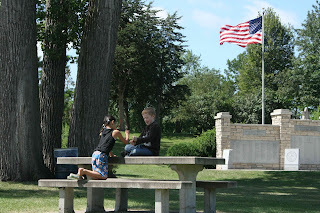 Thank you to all of you who signed up to quilt along with me again. I had no idea if anyone would be interested at all (or as crazy as I am), but I'm so glad to have you along for round 2! I'm going scrappy again. This time I'm going to try my best to make one a day, not do them in batches of 7-10 like last time. Not that it's a bad thing, but I find I enjoy it more just doing one a day. And I'm not feeling TOO guilty for starting round two, since I'm almost done with the first one. 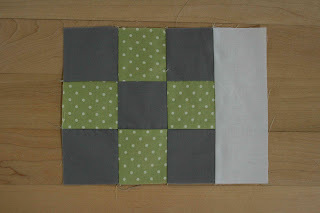 There is a tutorial here on how to piece a 9 patch using a strip piecing method if you would like to make multiple blocks at a time. 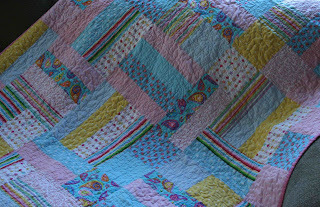 This is not a swap, just a quilt along. 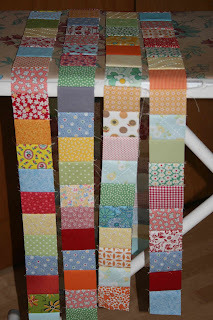 For the backing you will need about 5 1/2 yards of fabric. For the binding you will need about 3/4 yard of fabric. For the other yardage requirements, please see the previous post. 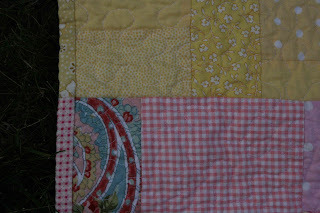 I know I'm not done with my first one a day quilt along quilt yet, but I'm going to start another one. (I have to since I'm gifting this one.) Anyone besides Heather care to join in round two? Same deal as the first round...make one 9 patch block a day for 70 days. 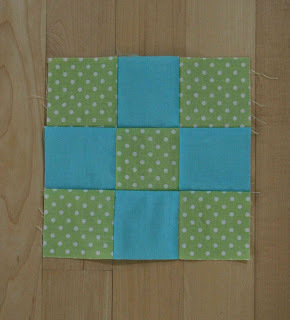 Each block is made from 9 2.5" squares. 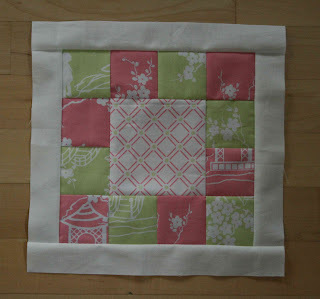 The finished block size will be 6" square. The quilt measures about 66" x 90". Sashing required is about 3.5 yards. We'll start (officially) on Monday. 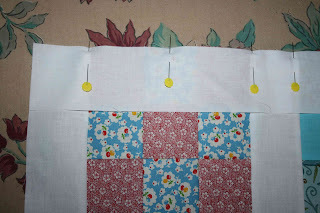 Today I used one of my curtains for a quilt backing. I think I just might be taking this "use what you have" thing a little too far. 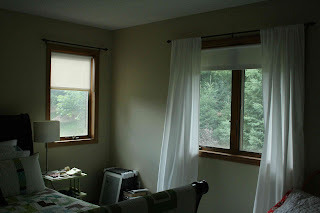 :) The curtain actually started out life as an IKEA flat sheet. I hope it works well in a quilt because a flat sheet for $2 is a GREAT deal for a lot of fabric! I guess you can see where my priorities are. I had the chance to meet up with Victoria yesterday. She is so sweet!!! 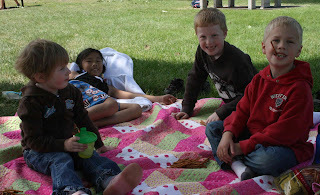 We had a wonderful time chatting while our kids ran and played for hours. 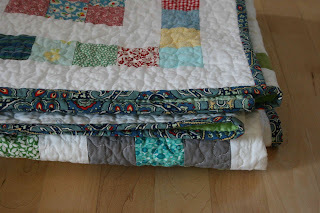 We talked about quilting (of course), blogs and life in general. 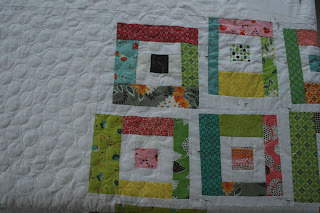 After chatting with her, I am so inspired to try new things with my quilting. I think it's safe to say that a good time was had by all. 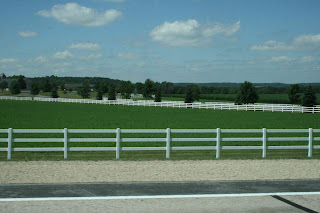 The drive was just gorgeous, too. I think the photo above needs to become a quilt. 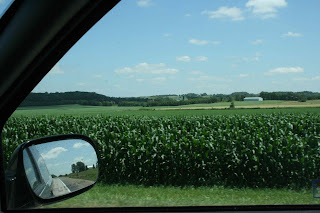 I love corn fields...can you tell I'm a farm girl at heart? 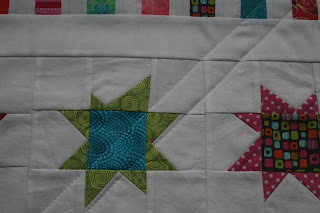 After procrastinating for 2 days, I finally bit the bullet and started quilting my happy go lucky quilt. 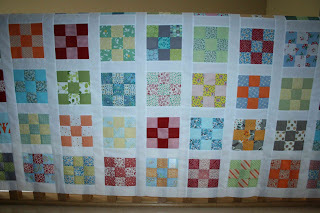 I love the quilt top so much that I don't want to mess it up by quilting it. I'm doing a more relaxed version of the pebble quilting than I did on this one. Up until I hit the color blocks, the quilting reminded me of a cheap mattress pad, which is definitely NOT the look I'm going for. 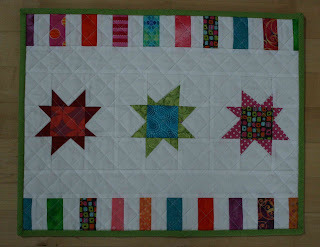 I think it's looking better now that I started quilting the colored blocks. Hopefully the binding helps pull it all together. I'll be holding my breath until it's done. I made my block for Victoria's Pixie Dust Gather last night. I am going to give it to her when we meet up today. I'm so excited!!! 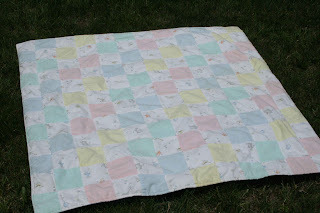 Also, there are still some open spots for the quilt retreat, if you are interested. The top is made from all scraps. It continually amazes me just how far scraps go...even with the absence of sashing. 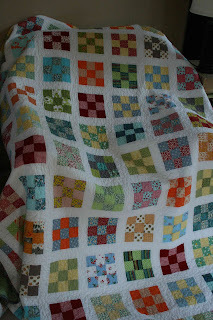 The remainder of the quilt came from my stash. There was no pattern for this quilt, I just designed it as I went along. I changed binding colors to match the color blocks. I love that detail. To quilt it, I did a simple stipple in white thread. The backing couldn't be a better match, could it? After washing it measures 40" x 53". 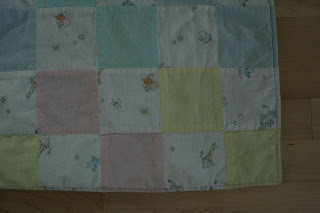 I need to remember to make more baby quilts. They are so fun to make and easy to finish up quickly. Camille and Carrie are having a parade of quilts. Since I've enjoyed seeing so many first quilts, I thought I would join in the fun. I've learned so much since my first quilt. A good sewing machine really makes a difference. 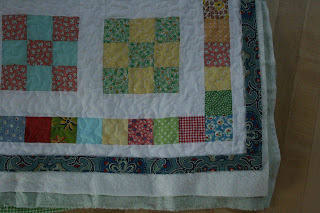 Quilting is hard at first, the learning curve is steep, but once you get over the hump it's so worth it. Practice really does help. Simple patterns are good. And a fabric addiction is hard to kick. 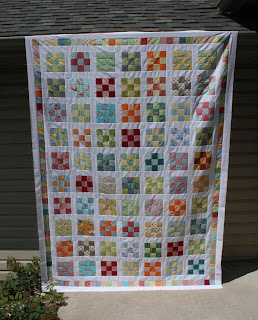 After making my first quilt, I recall thinking "I can't believe I just made a quilt!" I still get a thrill when finishing each one. It doesn't get old, even after one hundred and some odd times. 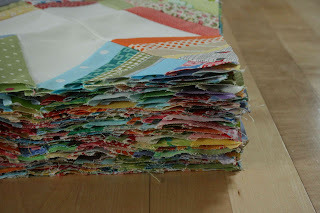 First, I made a quilt sandwich, using spray adhesive to baste the layers together. 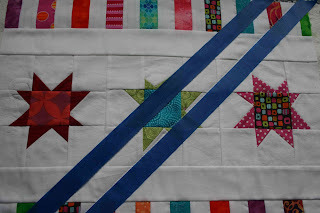 Place a piece of painters tape (or masking tape) on your quilt top on the diagonal. Just eyeball it...no measuring required. The tape shown here is 1" wide. You can use any tape width you would like. 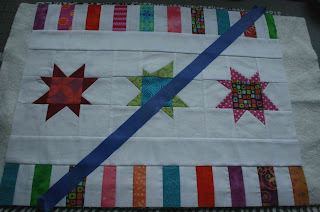 On a larger piece, like a baby quilt, 2" wide tape is ideal. 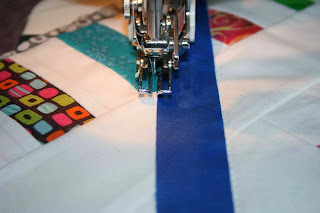 Move the tape to the outside of the quilting line. I added another line of tape to help speed up the process. 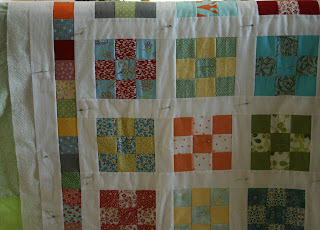 Quilt on the outside of each line of tape. Repeat as many times as necessary. You can re-use the tape between 5-10 times. 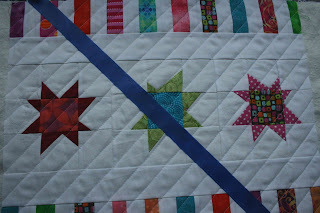 Once you are done quilting in one direction, start the process for the other direction. Again, no measuring is required...just eyeball it. Repeat the process as many times as necessary. And that's it. Easy, right? I think I might have found a new obsession in maverick stars. They are so much fun!!! 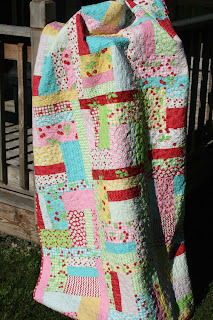 my sweet, sweet friend Linda sent me this quilt for my birthday!!! isn't that so sweet? I LOVE IT! Have a great holiday weekend! And THANK YOU so much for all the well wishes for my retreat teaching opportunity. I appreciate it so much!